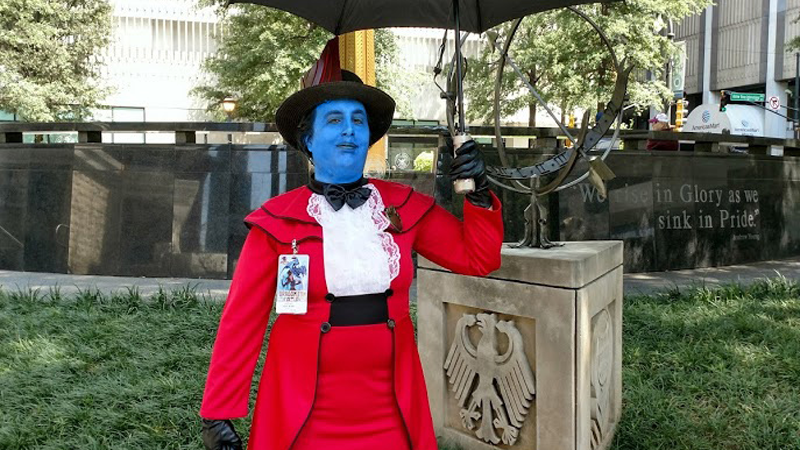 Kinja user Mea.Glitch’s Yondu/Mary Poppins mashup was a delight. If you excitedly turned over your calendar this week and promptly donned a witch hat and surrounded yourself with decorative gourds, you’re probably already very aware that October—the officially designated Spooky Season—is upon us. This can only mean two things: Halloween, and io9's yearly Halloween Costume Show! Every year, we ask you to give us a look at what fabulous costumes you, your family, or even your pets will be wearing for All Hallow’s Eve, and all spooky-adjacent events, so we can all admire your handiwork in celebration of frightfully good costumery. As in previous years, we’re kicking off the festivities right from the get-go of the month, so whether you’re still working on crafting your costume, or you’ve already got one sorted for parties before the big day, we want to see your pictures—final costume, work-in-progress, whatever! The month-long time frame gives you plenty of time to whip something up, but if you’ve not started just yet, we’ll be running weekly check-ins every Tuesday throughout the month highlighting reader submissions so far, before culminating with a grand roundup of every submitted costume on Halloween itself. So you’ve still got time to share your costume with us. The best of the very best costumes will be lavished with praise and featured right here on io9! If you need some inspiration to get started, be sure to check out the links below to previous Costume Shows, which included some truly delightful costumes, and equally delightful puns.